Our guide to Madison will help you find the best vegetarian restaurants in Madison Wisconsin. Madison's picturesque setting is beyond enviable, nestled as the city is amid four glacier-created lakes. Even better, the downtown district claims the isthmus between Lakes Monona and Mendota, ensuring that both water and views are never too far distant. Presiding over everything is the State Capitol, an impressive domed edifice whose silhouette commands the scenic skyline. The lovely city is a far cry from the tiny settlement that existed early on, when the site of the capital was chosen by virtue of location alone. For an initial overview of the city, make sure to wander through the Capitol and check out events held on its lawn, explore the Frank Lloyd Wright-designed Monona Terrace, and browse the shops and restaurants along State Street. These, along with Madison's parks and museums, define the city, illustrating the compatibility between what nature has provided and what humanity has wrought in the city among the lakes. There are tons of great vegetarian restaurants in the city of Madison, our city guide will help you find the best vegetarian restaurants. You may have a hard time deciding what to do in Madison, but we make your decision easy. 1 S Pinckney St, (608) 268-0114 - Sunprint Cafe & Catering is a vegetarian restaurant located in Madison WI. 1146 Williamson St, (608) 280-0104 - Lao Laan-Xang Restaurant is a vegetarian restaurant located in Madison WI. 1441 Regent St, (608) 255-2248 - Vientiane Palace Restaurant is a vegetarian restaurant located in Madison WI. 151 W Gorham St, (608) 255-2848 - Vientiane Palace Restaurant II is a vegetarian restaurant located in Madison WI. 1851 Monroe St, (608) 256-8804 - Dardanelles Restaurant is a vegetarian restaurant located in Madison WI. 2089 Atwood Ave, (608) 244-8505 - Monty's Blue Plate Diner is a vegetarian restaurant located in Madison WI. 2098 Atwood Ave, (608) 819-0140 - Lao Laan Xang Restaurant is a vegetarian restaurant located in Madison WI. 318 State St, (608) 251-9225 - Himal Chuli Restaurant is a vegetarian restaurant located in Madison WI. 334 State St, (608) 251-3626 - Chautara Restaurant is a vegetarian restaurant located in Madison WI. 4222 E Towne Blvd, (608) 663-3899 - Takumi Japanese Restaurant is a vegetarian restaurant located in Madison WI. 6754 Odana Rd, (608) 827-9120 - Saigon Noodle is a vegetarian restaurant located in Madison WI. 728 State St, (608) 252-6200 - Dandelion Food Cart is a vegetarian restaurant located in Madison WI. 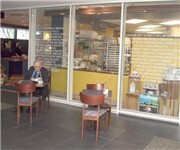 7475 Mineral Pt Rd, (608) 829-1168 - Hong Kong Cafe West is a vegetarian restaurant located in Madison WI. 916 Williamson St, (608) 729-5575 - Escape Java Joint-Art Gallery is a vegetarian arts and entertainment located in Madison WI. There are plenty more vegetarian restaurants in Madison. See all vegetarian restaurants in Madison Wisconsin.